Both the terms theme and topic play a unique and independent role in writing. Theme generally refers to the central idea or a perception conveyed in writing. A topic is the subject that is treated or presented within writing. Topics play the role of explaining what a story is all about, while, themes explain the reason why it was written in the first place. The two terms can be confusing, especially to students when asked by their teacher to write essays based on a certain theme with a particular topic. Many feel the two terms should be used interchangeably, but the fact is they are two totally different concepts used in writing. The theme of a piece of writing is the main meaning or the perception conveyed through the words used. All forms of writing, (blogs, poems, essays) must have a theme. Themes are further divided into two; minor and major themes. Both types can be included in the writing. Themes are not listed or mentioned by the writers, the reader must infer the themes. A theme can only be understood after one has read the whole work. A theme has two subdivisions; a concept and a statement. A concept is the one that is conditional to readers while a statement is envisioned by the writer. Themes reflect the personal views of the writers as well as the readers since everyone’s perception about a certain theme is different from another. The content and main subject of a performance is highly related to the theme. The main message that the writer wants to pass to his audience is closely related to its theme rather than it is to its topic. So as to be consistent in what they write, most writers choose a specific genre so as to gather a fan base. This is why when most people want to get an idea of what a novel is about they do not go back to the topic, they look for the theme of the novel so as to get a clear understanding of what the writer wants to pass on. Theme is not only restricted to text, it can also manifest itself in things such as music and dance. A topic is a discussion in a piece of writing that clearly explains what the writing is talking about. They are easy to pinpoint and writers use them to explain the general topic of their written material. A topic is well stated at the beginning of any academic script. Without a well stated topic, it is difficult to know what the piece of writing is talking about. A good topic helps a writer to bring together his thoughts and therefore assist him to create work that is well written and organized. A topic is definite and it clarifies the main focus of a book or any academic paper. For one to come up with a good topic, every writer should ensure they come up with something that is interesting and relevant to their target audience. Their chosen topic should be timely and significant. If a writer decides to write a persuasive script, then their topic should be somewhat controversial. Topics should be well researched to avoid misleading the readers. A theme is the main messaged passed on through writing while a topic is the major subject explained in writing. A theme clarifies why a certain script has been written while a topic explains what the script is all about. A theme is not stated; it is implied, while a topic is clearly stated. On very few occasions, will writers state the themes. A theme and a topic are very closely related. 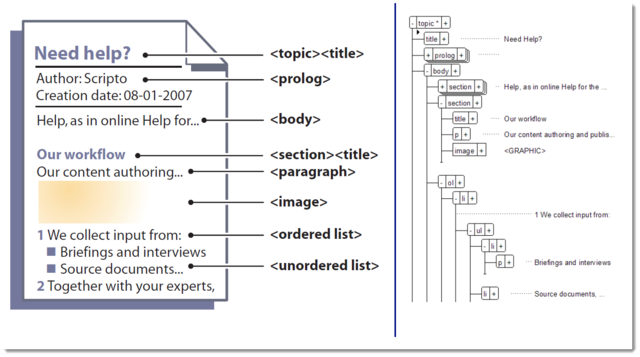 Although they are not interchangeable, it is not possible to draw a clear line that differentiates a theme form a topic. For example, Equality could be the theme of an election but it could also be the topic of an academic paper. A theme is general and it may differ from one person to another depending on the individuals’ perception. This is why a theme is mostly implied. Both a theme and a topic align the readers’ line of thought in order for the reader to understand what the writer is trying to convey. A theme and a topic also assist the writer to progress well from being too general and narrowing down to a specific thing that will enable them to write readable material. They assist in being persuasive as well as captivate and entertain the reader. Evah Kungu. 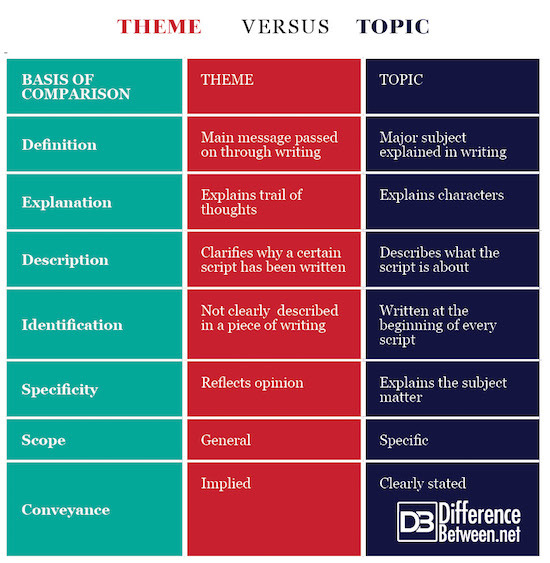 "Difference Between Theme and Topic." DifferenceBetween.net. March 1, 2019 < http://www.differencebetween.net/language/difference-between-theme-and-topic/ >. Griffith, Kelley (2010), Writing Essays about Literature, Cengage Learning 8(5), 40-57, retrieved February 10, 2013 . Pinault, David (2015), Story Telling Techniques in the Arabian Nights, Studies in Arabic Literature, 15(5), 18-67, Retrieved February 2016.